Franken Holidays is run by Mark and Roberta Wolff. We live in Surrey, UK with our 2 children. We travel here several times a year to enjoy the region and always return feeling refreshed. This property was bought because we love the area and we wanted to share it with our family. We always enjoy it and we hope you do also. We have been coming to Franconia since 1999 when a family member retired in the area nearby. We all fell in love with the region and in 2007 we had the opportunity to purchase this property in this very remarkable town. We have been having happy family holidays here ever since. This area is easily accessible by car or air. We drive most often as it works for us. There really is something for all the family in the area. The town is quiet and traditional and a chance to sample the outstanding food and wine that Franconia has to offer. The surrounding countryside is simply beautiful, the vineyards, orchards and fields around the town are all open to explore. The area is perfect for cyclists and hikers and includes the Steigerwald Nature Park, just a few kilometers away. For those needing more excitement there are several nearby bigger towns and villages to explore. We aim to make your holiday as enjoyable as possible by providing outstanding accommodation and all you should need for a comfortable stay; so you can concentrate on your holiday. We want you to feel at home. You should be able to arrive at the house and concentrate on settling in and exploring the area, not have to immediately find a shop to get basic supplies! We provide a basic supply of tea, coffee, sugar, soap, washing up liquid, shower gel, dishwasher tablets, bin bags, toilet rolls etc. to get you started. We can also book you a table at a local restaurant if you are arriving late. Let us know if you have any specific interests or requirement and we will look into what is available for you in the area. 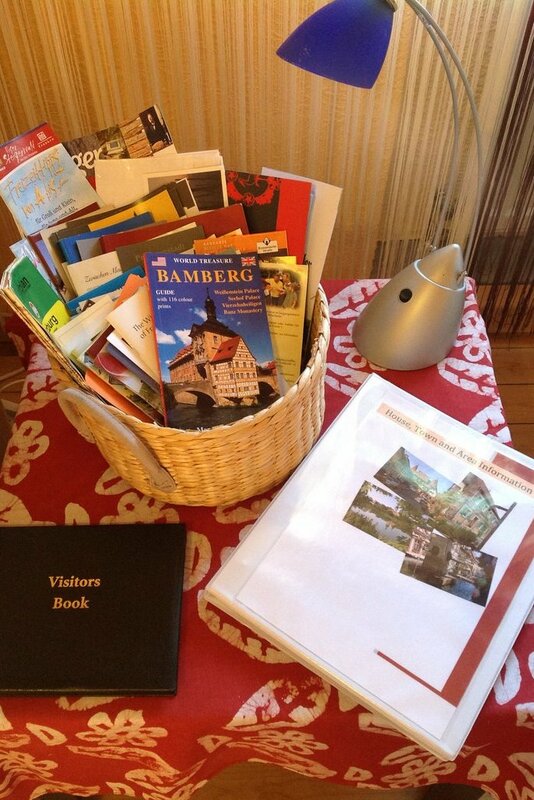 In the house you will find an extensive selection of tourist information, brochures and guide books. 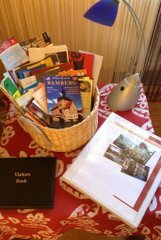 We also provide a "House, Town and Area Information" file with may suggestions of things to do. Additionally sample menus and other information has been translated to help you get the most from your holiday. You can also find us listed on the following sites. Owners Direct apartment rentals, here.